When a book really takes off and becomes a huge bestseller, I tend to steer away from it, and I'm not sure why. Perhaps it's a desire not to read what everyone else is reading, not to conform and become 'one of the crowd' and follow the trend. Anyone can stick to reading novels from the top 10 bestseller list, but it doesn't take any effort and in my opinion is a lazy way to choose a book. I believe that books need to be 'discovered' and I love to find a book that isn't well known and tell everyone about it afterwards. 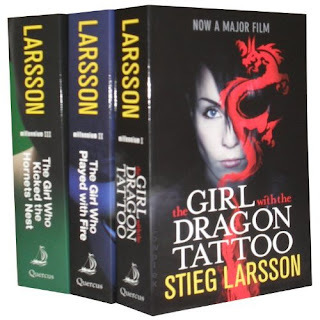 However, it must be said that the Millennium trilogy by author Stieg Larsson has drawn so much attention this year, and is being highly acclaimed amongst critics, that I had to bow to the pressure and dive in. And boy I'm glad I did. In the first book, The Girl With The Dragon Tattoo, we meet two of the main characters: Michael Blomkvist and Lisbeth Salander. Blomkvist is a Swedish journalist, working for Millennium magazine (hence the name of the trilogy) and is hired to investigate the mystery surrounding the unsolved disappearance of an heiress, Harriet Vanger. Lisbeth Salander is a genius hacker with a photographic memory, extremely poor social skills and a mysterious past who becomes involved in the investigation with Blomkvist. I was instantly drawn to the character of Salander, and for me, this is what made the book so intriguing and cutting edge. Salander and Blomkvist continue on in the second book of the Millennium series, The Girl Who Played With Fire. This too was a riveting read, and I raced through it. This time Salander is in trouble and Blomkvist tries to help. I don't want to give any of the plot away, but it needs to be said that the crimes are nasty, and there is quite a lot of graphic description littered throughout the pages in both books that may be too much for some readers. In my opinion, the detailed plot, complex characters and ability by Larsson to keep the readers on the edge the entire time is the secret to his success. Sadly Stieg Larsson died in 2004, and I must admit that knowing this in advance also added to the intrigue and my decision to pick up his first book. I'm yet to read the third in the series The Girl Who Kicked The Hornet's Nest however I'm really looking forward to it.